Citation: C N Trueman "John Wright"
John Wright, along with his brother Christopher, was a conspirator in the 1605 Gunpowder Plot – an attempt to kill James I and as many members of Parliament as was possible. Unlike the conspirators who were caught, with the exception of Francis Tresham, John Wright escaped the butchery of being hung, drawn and quartered. John Wright was born on January 13th, 1568. He attended, along with his brother Christopher, the same school as Guy Fawkes in York. Wright was brought up in a strictly Catholic environment. His parents were imprisoned for a total of fourteen years for their beliefs and this must have had a major influence on how both Wright’s viewed society then and how Catholics were treated. In 1596, Elizabeth I fell ill and her government feared that known Catholics would take advantage of the situation. As a result John Wright and other known Catholics who were not trusted by the government, were arrested and placed in the Tower of London. They were released when Elizabeth recovered her health. In 1601 Wright took part in the failed rebellion by the Earl of Essex – Robert Devereux. Despite what could have been classed as treasonable activity, it was decided that Wright only played a minor part in the rebellion and he was imprisoned. John Wright was an acquaintance of Robert Catesby and as a result was drawn into what became known as the 1605 Gunpowder Plot. The plotters had made plans to flee London if the authorities found out about what was happening. 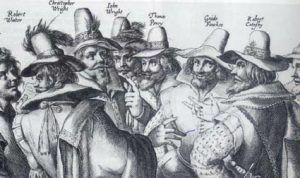 The letter sent to Lord Monteagle suitably alerted the government and after the capture of ‘John Johnson’, Guy Fawkes, the plotters fled to Holbeche House. On November 8th men led by the Sheriff of Worcester surrounded the manor house. The conspirators would have been well aware of what awaited them if they surrendered and they decided to fight their way out. The odds were stacked against them and John Wright was shot and killed – as was his brother Christopher.